Canny Collar is a revolutionary collar that is used by top animal associations as a key training aid to prevent pulling on the lead. Pulling on the lead is one of the most common problems when walking your dog. 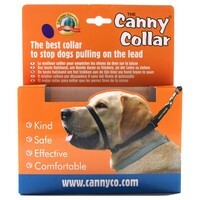 The Canny Collar has been manufactured to fix this problem and make walking a safe and pleasurable activity. The Canny Collar cleverly stops itself from riding up to the eyes or jerk the neck.